Last weekend I had the honour of launching Tania Ingram and Jennifer Harrison’s new picture book Oma’s Buttons. This beautifully written and illustrated book has been published by Penguin/Viking. The story tells of the relationship between a young girl and her Oma as they look through Oma’s button tin. For every button there is a link to a special person in Oma’s life. The Coventry Library at Stirling is a fabulous space for a book launch and the staff there are brilliant at setting up and then packing up afterwards. I hope the book does well for everyone involved. 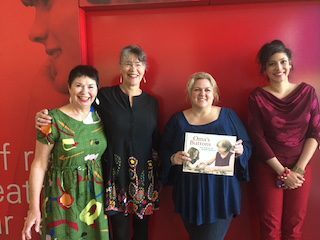 Janeen Brain, me, Tania Ingram (author) and Jennifer Harrison ( illustrator) in front of the brilliant red door at the Coventry Library.